We’re approaching the final hours of the Skullgirls Crowdfund campaign on Indiegogo, and earlier on Monday the creation of the third secret character was successfully funded. Overnight, the stage and story was funded as well, making this character a complete success. Unlike Squigly and Big Band, fans who donated to the crowdfund will get to choose who the third DLC character will be. To make things easier, Lab Zero updated their Indiegogo page to include a breakdown of who the characters are, what their story is, how they fight, and an idea of how they fight using established character examples (like Umbrella fighting like Order Sol from Guilty Gear). Lab Zero however will be putting a unique twist to the voting procedure. Similar to a tournament (or a reality singing competition, giver or take), voting sessions will be held four times. The first round is all characters up for voting. The Top 16 will move on to the next round. Then after the that the Top 8, then the Top 3. The one who wins the last round will be put into the game. Minette, works at Yu Wan’s Resturant. Beowulf, a retired wrestler itching to fight again. Scythana, an escaped prisoner of Gigan blood. Juju (unlisted but is in the image to the left). Panzerfaust, a result of the ASG’s Super Soldier program. Works under the Black Egrets. Adam, an elite soldier of the Black Egrets who also has the unfortunate task of babysitting Umbrella, Parasoul’s little sister. Molly, Communications Officer for the Black Egrets. Pilots a phone mech. Yes, you heard right. A Phone. Mech. Isaac, an archaeologist on the run after discovering something he probably shouldn’t have. Fights using Time-Travel. Venus, a Space goddess apparently. Aeon, A Time goddess apparently. Samson, Filia’s hair, but a bit more evil this time. He’s seeking a way to not rely on a host since he’s a parasite. And that’s all. Like Squigly and Big Band, this third character will be free for the first three months. There is however a fourth character that Lab Zero has put in place should the community feel more generous. 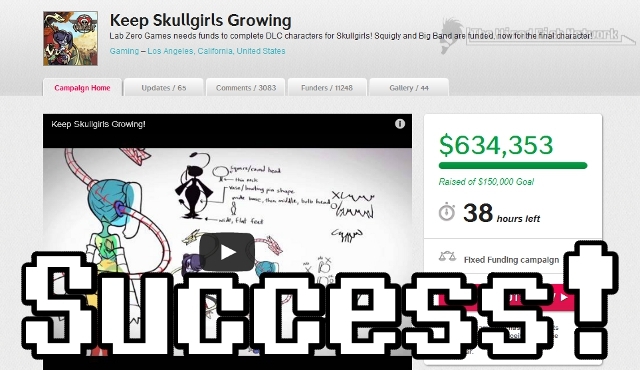 There’s also possibility of Mane6 getting the Skullgirls engine should the campaign reach the $725,000 mark. [UPDATE] Lab Zero has now proposed that if they meet that $725k mark, not only will Mane6 get the SG engine, but the Skullgirls dev team will make Robo-Fortune a full-on, full-blown character. There’s only 38 hours left as of this posting, so there’s a chance the goals won’t be met. But we’ve seen last minute clutches here when it comes to these, so who knows how this’ll turn out. This entry was posted in Gaming News and tagged Autumn Games, big band, crowdfund, fighting games, igg, indiegogo, konami, lab zero, Labzero, reverge labs, skullgirls, Squigly on March 26, 2013 by Steven T..